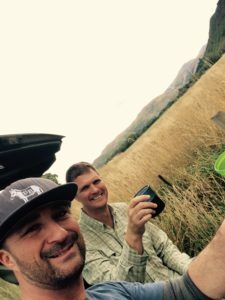 I woke up early one morning with the anticipation of chasing steelhead, but instead of driving to one of my favorite Oregon streams, I was going to fly someplace in the world to find a new one. 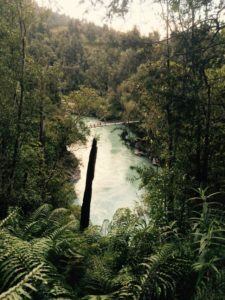 I decided on traveling to the southern island of New Zealand, to see for myself what the myth and lore of the “Rivers of the Southern Alps” was really all about. A classic trout steam near the Kokatahi river. A toast to the good life! And chasing monster brown trout. Thank you to Nathan Donaldson President of EO Wellington, New Zealand. The southern region of New Zealand has an appreciation of Mother Nature like nothing that I have ever experienced. Water, trees and fish and every other natural components of New Zealand are seen as valuable ingredients of Mother Nature. These ingredients are respected, appreciated and valued as a gift, not just as a natural resource. Up until my New Zealand travel, the term natural resource resonated as utilizing nature in a manner that is beneficial to people. 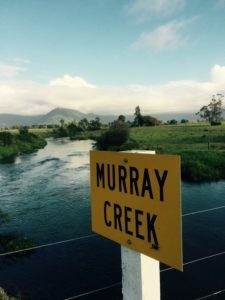 My experience in New Zealand was met with a different understanding. I realized that “natural resource” was not commonly used within the vernacular of the small towns and local jurisdictions. Don’t get me wrong, nature is woven into the economy of New Zealand, but is done so in a manner of appreciation. The result is a very powerful differentiation around the mindset of Mother Nature. 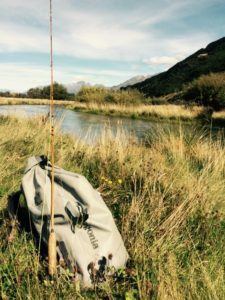 This bag and my fly rod hiked over 80 miles of stream bank. Just another day in paradise. Fishing to me, isn’t about the fish. It’s not about how big, how many, or even catching. It’s simpler and more important than that. In fact it’s so ingrained within my soul that it actually creates an imbalance if I don’t find myself knee deep in the water every 3 to 4 days. Hiring guides with fancy jet sleds to rage up a river or sitting in a boat pulling plugs while waiting for the bite, does not satiate my being. Suspension bridge over the Kokatahi River. Fishing to me is about the calm of life, energy of the earth and the simplicity of the moment. My best self is is found on a creek, fly rod in hand, with Mother Nature.